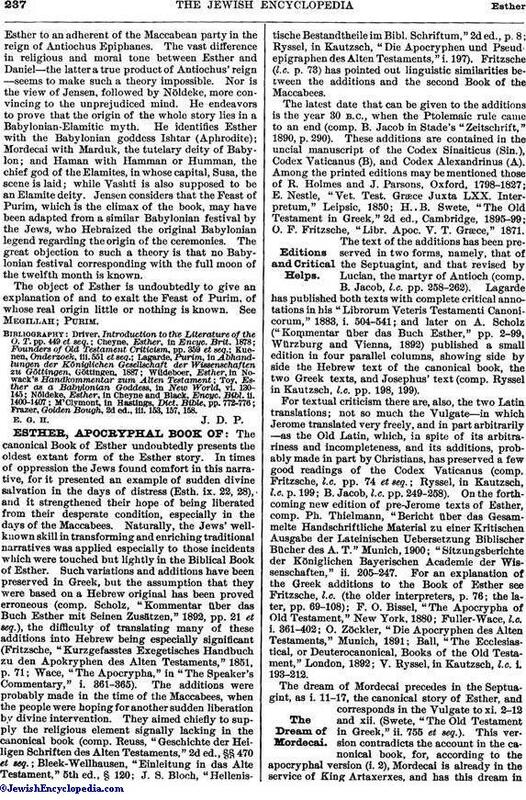 For textual criticism there are, also, the two Latin translations; not so much the Vulgate—in which Jerome translated very freely, and in part arbitrarily—as the Old Latin, which, in spite of its arbitrariness and incompleteness, and its additions, probably made in part by Christians, has preserved a few good readings of the Codex Vaticanus (comp. Fritzsche, l.c. pp. 74 et seq. ; Ryssel, in Kautzsch, l.c. 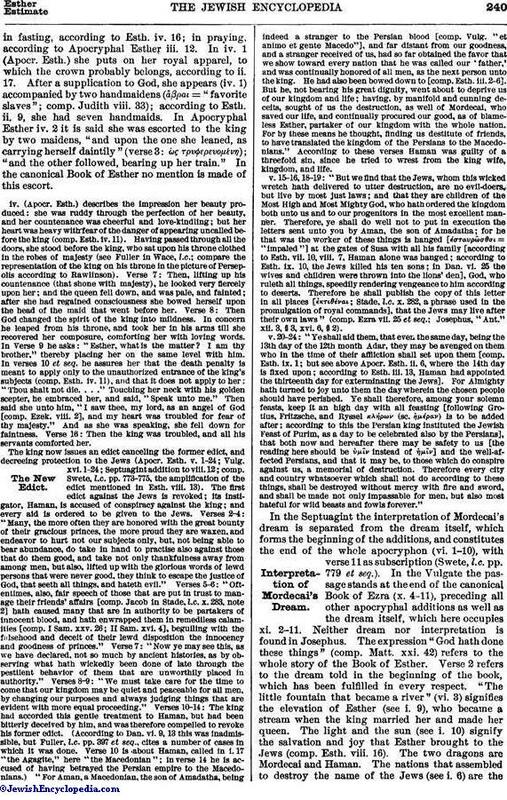 p. 199; B. Jacob, l.c. pp. 249-258). On the forthcoming new edition of pre-Jerome texts of Esther, comp. Ph. Thielmann, "Bericht über das Gesammelte Handschriftliche Material zu einer Kritischen Ausgabe der Lateinischen Uebersetzung Biblischer Bücher des A. T." Munich, 1900; "Sitzungsberichte der Königlichen Bayerischen Academie der Wissenschaften," ii. 205-247. 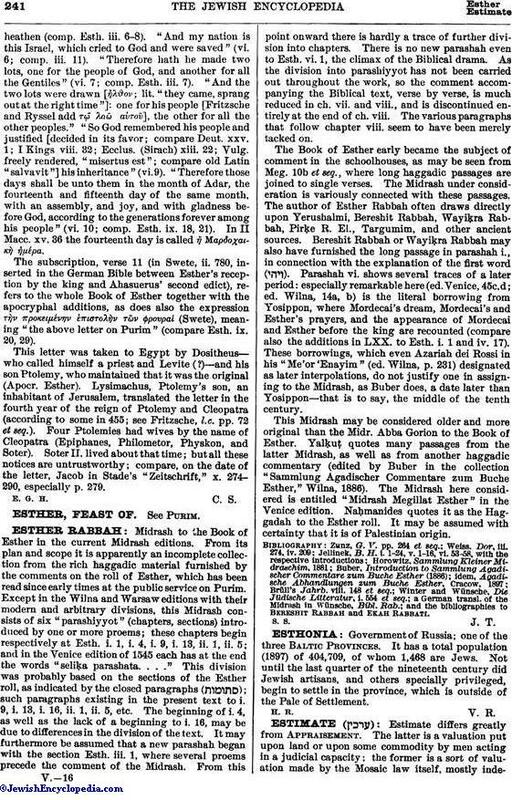 For an explanation of the Greek additions to the Book of Esther see Fritzsche, l.c. (the older interpreters, p. 76; the later, pp. 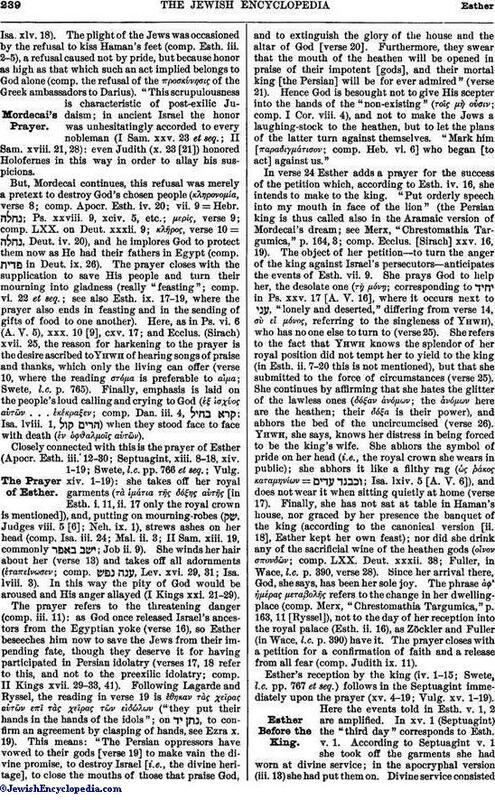 69-108); F. O. Bissel, "The Apocrypha of Old Testament," New York, 1880; Fuller-Wace, l.c. i. 361-402; O. Zöckler, "Die Apocryphen des Alten Testaments," Munich, 1891; Ball, "The Ecclesiastical, or Deuterocanonical, Books of the Old Testament," London, 1892; V. Ryssel, in Kautzsch, l.c. i. 193-212. The dream of Mordecai precedes in the Septuagint, as i. 11-17, the canonical story of Esther, and corresponds in the Vulgate to xi. 2-12 and xii. (Swete, "The Old Testament in Greek," ii. 755 et seq.). This version contradicts the account in the canonical book, for, according to the apocryphal version (i. 2), Mordecai is already in the service of King Artaxerxes, and has this dream inthe second year of that king's reign, whereas in the canonical version (ii. 16) Esther was not taken into the royal house until the seventh year of his reign, and Mordecai did not sit "in the king's gate"—that is, enter the king's service—until after that event (ii. 19-20). The author of the apocryphal Esther speaks of two conspiracies against Artaxerxes, and says that Mordecai preceded Esther in coming to court. His account is as follows: Mordecai as a servant in the palace sleeps with the courtiers Gabatha and Tharra (Esth. ii. 21, "Bigthan" and "Teresh"; Vulg. "Bagatha" [whence "Gabatha"] and "Thara"), and overhears their plot against the king. He denounces the conspirators, who are arrested and confess. The king and Mordecai write down the occurrence, and Mordecai is rewarded. As the conspirators are condemned to death (according to B. Jacob in Stade's "Zeitschrift," x. 298, the words of Codex B, διότι ἀνέρήθησαν, are to be added here; comp. Jerome: "qui fuerant interfecti"), Haman, who evidently was in league with them, plans to take vengeance on Mordecai (Apocr. Esth. ii. 12-17). Olive-Wood Case for Scroll of Esther, from Jerusalem. The second addition contains an edict of Artaxerxes for the destruction of all the Jews, to be carried out by Haman (Apocr. Esth. ii. 1-7; it follows Esth. iii. 13; comp. Swete, l.c. pp. 762 et seq.). The mere mention of the fact that an edict for the destruction of the Jews had gone forth, was a temptation to enlarge upon it. The "great king" (verse 1), as in Esth. i. 1, sends a letter to the governors of the one hundred and twenty-seven provinces of his kingdom—that extends from India even unto Ethiopia—saying that although personally he is inclined toward clemency, he is bound to look to the security of his kingdom. In a conference on the matter, he said, Haman, the councilor ranking next to him in the kingdom, had pointed out that there was one evilly disposed class of people in his realm, which, by its laws, placed itself in opposition to all the other classes, persisted in disregarding the royal ordinances, and made a unified government impossible. Under these circumstances, he said, nothing remained but to adopt the suggestion of Haman, who, having been placed in charge of the affairs of the state, could in a sense be called the second father of the king; this suggestion was to destroy by the sword of the other nations, on the fourteenth day of Adar (thirteenth of Adar in Esth. iii. 13, viii. 12, ix, 1), all those designated as Jews, together with their wives and children. After these disturbers of the peace had been put out of the way, the king believed the business of the realm could again be conducted in peace. 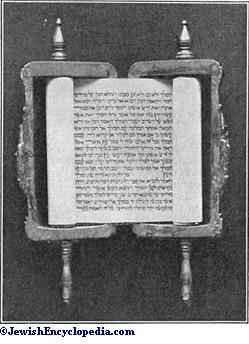 Scroll of Esther as Fixed in Olive-Wood Case. Closely connected with this is the prayer of Esther (Apocr. Esth. iii. 12-30; Septuagint, xiii. 8-18, xiv. 1-19; Swete, l.c. pp. 766 et seq. ; Vulg. xiv. 1-19): she takes off her royal garments (τὰ ἱμάτια τῆς δόξης αὐτῆς [in Esth. i. 11, ii. 17 only the royal crown is mentioned]), and, putting on mourning-robes ( , Judges viii. 5 ; Neh. ix. 1), strews ashes on her head (comp. Isa. iii. 24; Mal. ii. 3; II Sam. xiii. 19, commonly ; Job ii. 9). She winds her hair about her (verse 13) and takes off all adornments (ἐ;ταπείνωσεν comp. , Lev. xvi. 29, 31; Isa. lviii. 3). In this way the pity of God would be aroused and His anger allayed (I Kings xxi. 21-29). The prayer refers to the threatening danger (comp. iii. 11): as God once released Israel's ancestors from the Egyptian yoke (verse 16), so Esther beseeches him now to save the Jews from their impending fate, though they deserve it for having participated in Persian idolatry (verses 17, 18 refer to this, and not to the preexilic idolatry; comp. II Kings xvii. 29-33, 41). Following Lagarde and Ryssel, the reading in verse 19 is ἔθηκαν τὰς χεῖρας αὐτῶν επῖ τὰς χεῖρας τῶν εὶδώλων ("they put their hands in the hands of the idols"; on , to confirm an agreement by clasping of hands, see Ezra x. 19). This means: "The Persian oppressors have vowed to their gods [verse 19] to make vain the divine promise, to destroy Israel [i.e., the divine heritage], to close the mouths of those that praise God, and to extinguish the glory of the house and the altar of God [verse 20]. Furthermore, they swear that the mouth of the heathen will be opened in praise of their impotent [gods], and their mortal king [the Persian] will be for ever admired" (verse 21). Hence God is besought not to give His scepter into the hands of the "non-existing" (τοῖς μὴ οὖσιν; comp. I Cor. viii. 4), and not to make the Jews a laughing-stock to the heathen, but to let the plans of the latter turn against themselves. "Mark him [παρλδιγμάτισον; comp. Heb. vi. 6] who began [to act] against us." In verse 24 Esther adds a prayer for the success of the petition which, according to Esth. iv. 16, she intends to make to the king. "Put orderly speech into my mouth in face of the lion" (the Persian king is thus called also in the Aramaic version of Mordecai's dream; see Merx, "Chrestomathia Targumica," p. 164, 3; comp. Ecclus. [Sirach] xxv. 16, 19). The object of her petition—to turn the anger of the king against Israel's persecutors—anticipates the events of Esth. vii. 9. She prays God to help her, the desolate one (τῇ μόνῃ; corresponding to in Ps. xxv. 17 [A. V. 16], where it occurs next to , "lonely and deserted," differing from verse 14, σὺ εἶ μόνος, referring to the singleness of Yhwh), who has no one else to turn to (verse 25). She refers to the fact that Yhwh knows the splendor of her royal position did not tempt her to yield to the king (in Esth. ii. 7-20 this is not mentioned), but that she submitted to the force of circumstances (verse 25). She continues by affirming that she hates the glitter of the lawless ones (δόξαν ἀνόμων the ἀνόμων here are the heathen; their δόξα is their power), and abhors the bed of the uncircumcised (verse 26). Yhwh, she says, knows her distress in being forced to be the king's wife. She abhors the symbol of pride on her head (i.e., the royal crown she wears in public); she abhors it like a filthy rag (ὡς ῥάκος κλταμηνίων= ; Isa. lxiv. 5 [A. V. 6]), and does not wear it when sitting quietly at home (verse 17). Finally, she has not sat at table in Haman's house, nor graced by her presence the banquet of the king (according to the canonical version [ii. 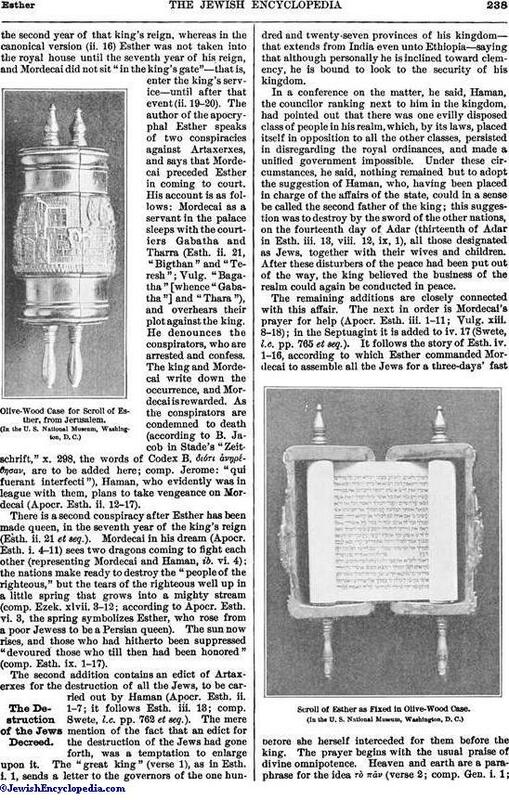 18], Esther kept her own feast); nor did she drink any of the sacrificial wine of the heathen gods (οῦνον σπονδῶν; comp. LXX. Deut. xxxii. 38; Fuller, in Wace, l.c. p. 390, verse 28). Since her arrival there, God, she says, has been her sole joy. The phrase ἀφ' ἡμήρας μεταβολῆς refers to the change in her dwellingplace (comp. Merx, "Chrestomathia Targumica," p. 163, 11 [Ryssel]), not to the day of her reception into the royal palace (Esth. ii. 16), as Zöckler and Fuller (in Wace, l.c. p. 390) have it. The prayer closes with a petition for a confirmation of faith and a release from all fear (comp. Judith ix. 11). In the Septuagint the interpretation of Mordecai's dream is separated from the dream itself, which forms the beginning of the additions, and constitutes the end of the whole apocryphon (vi. 1-10), with verse 11 as subscription (Swete, l.c. pp. 779 et seq.). In the Vulgate the passage stands at the end of the canonical Book of Ezra (x. 4-11), preceding all other apocryphal additions as well as the dream itself, which here occupies xi. 2-11. Neither dream nor interpretation is found in Josephus. The expression "God hath done these things" (comp. Matt. xxi. 42) refers to the whole story of the Book of Esther. Verse 2 refers to the dream told in the beginning of the book, which has been fulfilled in every respect. "The little fountain that became a river" (vi. 3) signifies the elevation of Esther (see i. 9), who became a stream when the king married her and made her queen. The light and the sun (see i. 10) signify the salvation and joy that Esther brought to the Jews (comp. Esth. viii. 16). The two dragons are Mordecai and Haman. The nations that assembled to destroy the name of the Jews (see i. 6) are theheathen (comp. Esth. iii. 6-8). "And my nation is this Israel, which cried to God and were saved" (vi. 6; comp. iii. 11). "Therefore hath he made two lots, one for the people of God, and another for all the Gentiles" (vi. 7; comp. Esth. iii. 7). "And the two lots were drawn [ἦλϑον; lit. "they came, sprang out at the right time"]: one for his people [Fritzsche and Ryssel add τῷ λαῶ αὐτοῦ], the other for all the other peoples." "So God remembered his people and justified [decided in its favor; compare Deut. xxv. 1; I Kings viii. 32; Ecclus. (Sirach) xiii. 22; Vulg. freely rendered, "misertus est"; compare old Latin "salvavit"] his inheritance" (vi.9). "Therefore those days shall be unto them in the month of Adar, the fourteenth and fifteenth day of the same month, with an assembly, and joy, and with gladness before God, according to the generations forever among his people" (vi. 10; comp. Esth. ix. 18, 21). In II Macc. xv. 36 the fourteenth day is called ἥ Μαρδοχαικὴ ἡμέρα. The subscription, verse 11 (in Swete, ii. 780, inserted in the German Bible between Esther's reception by the king and Ahasuerus' second edict), refers to the whole Book of Esther together with the apocryphal additions, as does also the expression τὴυ προκειμέυηυ ἐπιστολὴυ τῶυ φρουραί (Swete), meaning "the above letter on Purim" (compare Esth. ix. 20, 29). This letter was taken to Egypt by Dositheus—who called himself a priest and Levite (? )—and his son Ptolemy, who maintained that it was the original (Apocr. Esther). Lysimachus, Ptolemy's son, an inhabitant of Jerusalem, translated the letter in the fourth year of the reign of Ptolemy and Cleopatra (according to some in 455; see Fritzsche, l.c. pp. 72 et seq.). Four Ptolemies had wives by the name of Cleopatra (Epiphanes, Philometor, Physkon, and Soter). Soter II. lived about that time; but all these notices are untrustworthy; compare, on the date of the letter, Jacob in Stade's "Zeitschrift," x. 274-290, especially p. 279. E. G. H. C. S.